H.H. 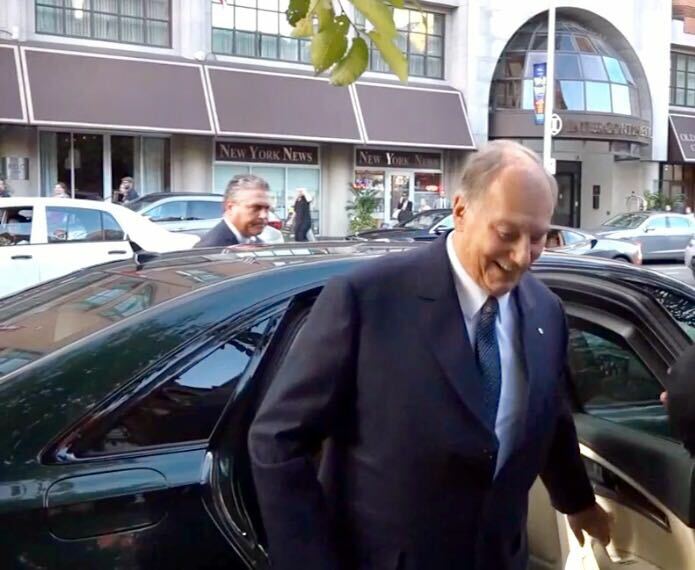 The Aga Khan will arrive today in Toronto, Canada at 17:00 EST. He will receive The Adrienne Clarkson Prize for Global Citizenship at an event on Wednesday 21 Sept 19:30 Toronto time. His speech will be webcast live. More news to follow. At 7:30 pm on September 21, 2016 at Koerner Hall in Toronto the inaugural Adrienne Clarkson Prize for Global Citizenship will be awarded at the marquee event of 6 Degrees — the new public initiative of the Institute for Canadian Citizenship. The prize will be given annually to an individual who has, through thought and dialogue, encouraged approaches and strategies that strive to remove barriers, change attitudes, and reinforce the principles of tolerance and respect. The symbolic importance of this prize has never been greater. In a time of unprecedented movement, displacement and re-settlement by immigrants and refugees, one of the central challenges we face is how we all live together. We are pleased to announce that His Highness the Aga Khan is the first recipient of this globally relevant prize. The 49th hereditary Imam (spiritual leader) of the Shia Ismaili Muslims, His Highness has dedicated his life’s work to improving living conditions for the world’s most vulnerable populations, and to fostering an understanding of the importance of pluralism to global harmony. The Aga Khan Development Network (AKDN), founded and chaired by His Highness, is active in 30 countries and employs over 80,000 people. Its non-denominational agencies work in areas ranging from health and education to rural development, architecture, culture, economic sustainability and strengthening civil society. At the award ceremony, His Highness the Aga Khan will receive the prize from the Rt. Hon. Adrienne Clarkson, and will share his wisdom and experiences with the audience on issues confronting the world today. He will then be joined on stage for a conversation with Madame Clarkson. The internationally-acclaimed vocalist and songwriter Rufus Wainwright will perform in honour of the prize recipient. The jury for the 2017 Adrienne Clarkson Prize has also been announced. It will consist of The Rt. Hon. Beverley McLachlin, P.C., The Hon. Bill Graham, C.M., P.C., John Ralston Saul, CC, and the Rt. Hon. Adrienne Clarkson. The prize will be awarded on Sept 27, 2017. The awarding of the Adrienne Clarkson Prize for Global Citizenship will culminate the 6 Degrees Citizen Space 2016 conference presented by the Institute for Canadian Citizenship. The annual award recognises a leader whose life has demonstrated a steadfast commitment to the ideals of belonging and inclusion. Through their words, actions and results, a recipient will have encouraged thought and dialogue, approaches and strategies that strive to remove barriers, change attitudes, and reinforce the principles of tolerance and respect. We are pleased to announce that Mawlana Hazar Imam is scheduled to receive the inaugural Adrienne Clarkson Prize for Global Citizenship on the evening of Wednesday, September 21st. The award ceremony, including Mawlana Hazar Imam’s address, will be webcast live on theismaili.org, akdn.org as well as on the website of the Institute for Canadian Citizenship beginning at 5:30pm MST. A summary video showing excerpts of the awards ceremony, speech and other visit clips will be shown after Jamatkhana Ceremonies on Friday, September 23rd. The Adrienne Clarkson Prize for Global Citizenship will be the marquee event of the 6 Degrees Citizen Space conferences coordinated by the Institute for Canadian Citizenship. The award is to be conferred annually to a leader whose life has demonstrated a steadfast commitment to the ideals of belonging and inclusion. Through words, actions and results, this award recipient will have encouraged thought and dialogue, approaches and strategies that strive to remove barriers, change attitudes, and reinforce the principles of tolerance and respect. Mubaraki to all on this special occasion. 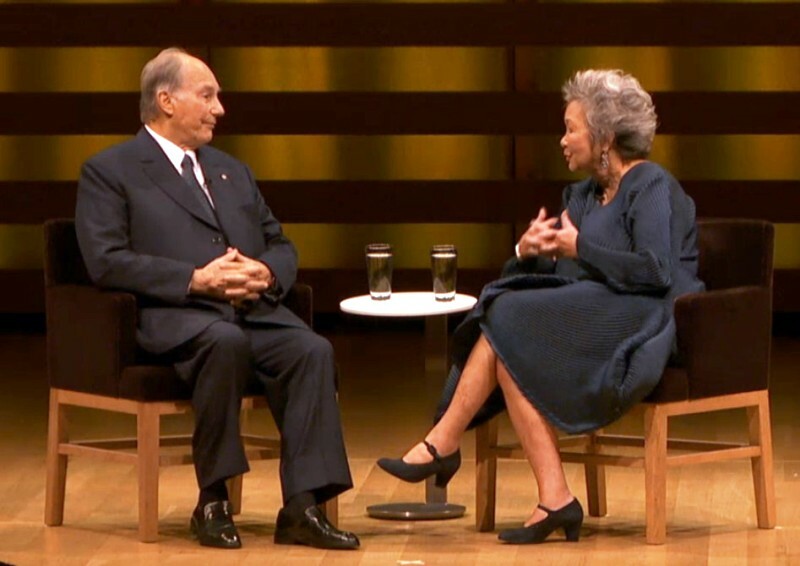 The Aga Khan — spiritual leader of Ismaili Muslims worldwide and renowned for his leadership of a global network of organizations working in education and development — will be presented with the first annual Adrienne Clarkson Prize for Global Citizenship on Wednesday in Toronto. Clarkson, Canada’s former governor general, said that when picking a recipient for the new award in her name she was looking for an international figure who models the qualities of a good citizen and who makes the lives of others better. In an interview with the Star, she highlighted the need to welcome newcomers from other countries, with the displacement and resettlement of millions now a pressing issue around the world. “Basically we have a situation in the world now where we are seeing movement, and we have to take the traits of good citizenship wherever we go,” Clarkson said. She noted that Ismaili Muslims have their own experiences of diplacement — many were expelled from East Africa in the early ’70s. That approach, Clarkson said, is the basis of Canadian citizenship and can serve as an example for people around the globe. She praised in particular the work of the Aga Khan in the area of education. Clarkson said the award is intended to be based on the recipient’s lifetime of work, not just contributions in the past year. The Aga Khan chairs the Aga Khan Development Network — a group of organizations that do a range of development work in more than two dozen countries around the world, with a staff of more than 80,000 people. The Aga Khan Museum opened in Toronto two years ago, with a mission to promote an understanding of contributions made by Muslim societies and to encourage tolerance. The winner of the initial award was chosen by Clarkson and the board of the Institute for Canadian Citizenship (of which she’s a co-founder) — the charity presenting Toronto’s 6 Degrees Citizen Space series, where this is the closing event. After he receives his award — a medal designed by Ottawa-based sculptor Anna Williams — at the ceremony at the Royal Conservatory’s Koerner Hall on Wednesday evening, the Aga Khan will join Clarkson to discuss global issues in front of the crowd. Rufus Wainwright is slated to perform at the event. Tickets are sold out, but the event will be streamed online. Next year’s prize will be awarded in September 2017. 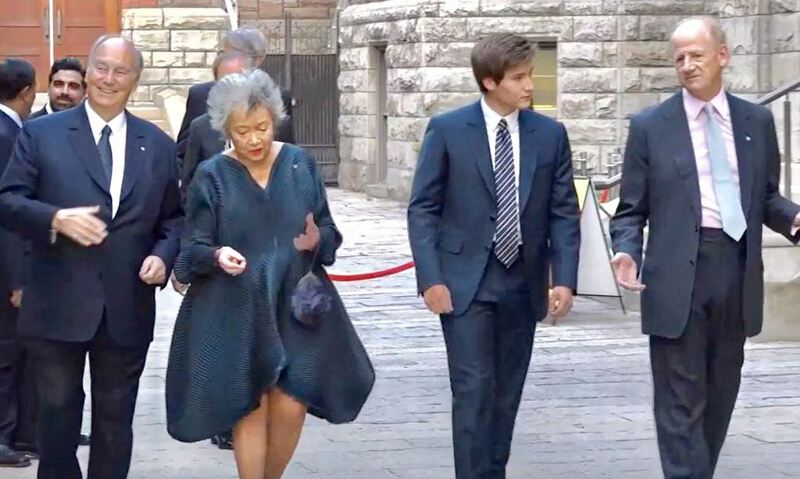 His Highness Prince Karim Aga Khan IV will be awarded the inaugural Adrienne Clarkson Prize for Global Citizenship Wednesday, Sept. 21 at a ceremony downtown. The prize, to be handed out at the Royal Conservatory of Music, will be given annually to an individual “who has through thought and dialogue, encouraged approaches and strategies that strive to remove barriers, change attitudes, and reinforce the principles of tolerance and respect,” according to a release. 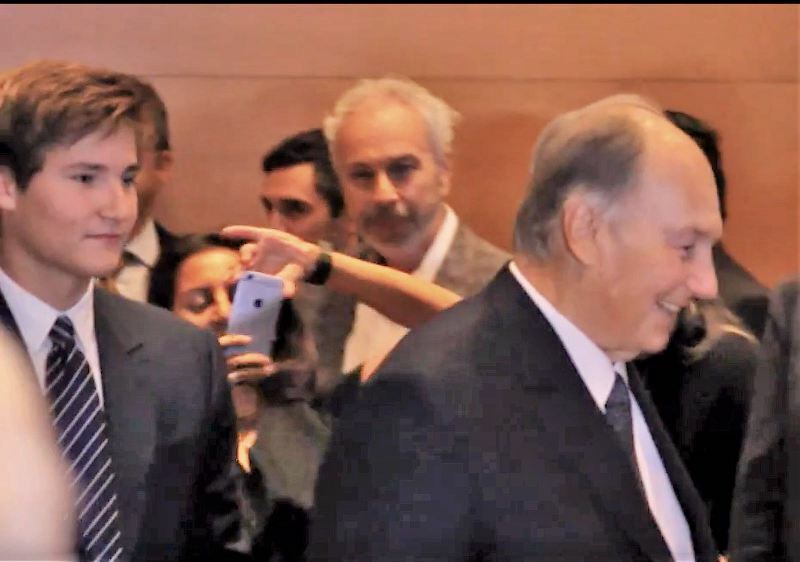 The 49th hereditary Imam (spiritual leader) of the Shia Ismaili Muslims, the Aga Khan is head of the Aga Khan Development Network (AKDN), and in 2010 was made an honourary Canadian citizen. He also funded the development of the Aga Khan Museum, which is situated in the Don Mills Road and Wynford Drive area of North York. Even as the northern hemisphere’s Islamophobia is scaling new heights following the recent New York bombings, its neighbour Canada has awarded the current and 49th head of the Ismaili Muslims, the Aga Khan, with the inaugural Adrienne Clarkson Prize for Global Citizenship that recognises leaders committed to the ideals of belonging and inclusion. The Aga Khan will receive the award in a ceremony on September 21 in Canada. “Globally, the amount of tolerance and love for the other religion is rapidly decreasing. The Aga Khan receiving this award comes as a symbol of peace since there is more need for the world to know what Islam is really about,” said Akbar Merchant, a member from the community. However, other members are not so quick to conclude that Mumbai falls under the same bracket of intolerance. “Mumbai, I think is extremely pluralistic; people are very giving and forgiving. We Mumbaikars are still very peaceful at heart,” said Riyaaz Makaniy, another community member. In Mumbai, The Diamond Jubilee School and the Prince Aly Khan Hospital — both in Mazgaon — are the two institutes that are under the aegis of the Aga Khan Development Network, which also recently conducted restoration of the Humayun’s Tomb in Delhi. Not just in Mumbai, but the Aga Khan has institutes all over India, and abroad as well. “His highness the Aga Khan has been working in countries all across the world and an award like this will only inspire others to be more tolerant and giving,” another member Reshma Lakhani added. 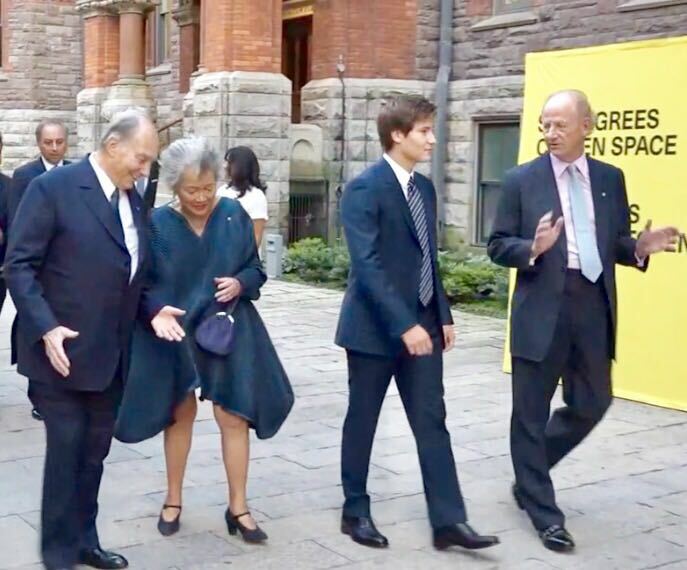 #Ismaili #AgaKhan received The Adrienne Clarkson Prize for Global Citizenship on Wednesday 21 Sept 19:30 Toronto time. BRAVO! the first hour is just music so fast forward to the 1hr mark on the player. not sure how long it will stay up. This is a deeply memorable moment for me. My warmest thanks go to Adrienne Clarkson, John Ralston Saul and the Institute for Canadian Citizenship for this wonderful Award, and to all of you for sharing in this important moment in my life. Imagine the honour one feels - to receive an Award named after Adrienne Clarkson, presented by Adrienne Clarkson, and dedicated to the ideals of which Adrienne Clarkson is such a leading example. As you know, Madame Clarkson has experienced, in her own life, what the concept of Global Citizenship really means. Arriving as a two-year old refugee from outside Canada, she became a Canadian citizen in the fullest and best sense. And she also became an extraordinary advocate for what Global Citizenship truly means. In so many roles over so many years, as a thoughtful journalist and broadcaster, as Canada’s distinguished Governor General, and as a forceful national matriarch, she has continually been reaching out to diverse peoples in Canada, and around the world, not only in eloquent words but also in decisive action. Madame Clarkson ne s'est pas contentée d'être une amie et une inspiratrice ; elle a aussi été pour moi un partenaire pour qui j'ai la plus grande estime. Sa contribution aux travaux de notre Réseau de Développement a été marquée par son mandat d'Administratrice du Centre Mondial du Pluralisme à Ottawa, l'un des nombreux projets collaboratifs dans lesquels mes institutions, avec une profonde reconnaissance, se sont engagées aux côtés du gouvernement canadien. One might say that to receive an Award for Global Citizenship from Adrienne Clarkson is a bit like receiving an Excellence in Hockey Award from Wayne Gretzky! As for the concept of Global Citizenship, that was something I began to think about seriously when I became the Imam of the Ismaili Muslims almost 60 years ago. Happily, I was able to share my thinking about Global Citizenship with the dedicated people of the Aga Khan Development Network - with whom I want to share this honour today. What we learned from the very start was that advancing our development agenda, we would be required to respect the immense diversity of ethnicities, of languages and of cultures, of faiths, of philosophies. In short, we learned to embrace the values of Global Citizenship. As we discuss this concept, and the spirit of Pluralism on which it rests, it is only realistic, in my view, to acknowledge an increasing frustration concerning the pluralism story. We talk sincerely about the values of diversity, about living with complexity. But in too many cases more diversity seems to mean more division; greater complexity, more fragmentation, and more fragmentation can bring us closer to conflict. The stakes seem to be getting higher as time goes by, but so do the obstacles. And that is why I will focus my brief remarks today on the continuing challenges to the ideals of Global Citizenship. One enormous challenge, of course, is the simple fact that diversity is increasing around the world. The task is not merely learning to live with that diversity, but learning to live with greater diversity with each passing year. One aspect of this changing reality is the challenge of human migration. More people are moving, willingly and unwillingly, across national frontiers than ever before. In country after country, the migration question is a central issue of political life. Often it is THE central issue. And old habits of mind, including narrow, exclusionary definitions of citizenship, have not met the challenge. That was true three months ago when Great Britain voted to leave the European Union. It is true in pre-election debates in France, where I now live, and in the United States, where I went to university. It is true in Canada, as you well know, though Canada has certainly been a world leader in expanding the concept of citizenship. But the challenge is felt everywhere. Nor is the migration challenge likely to dissipate any time soon, especially as war, and violence, and economic deprivation, displace more and more people. In such a world, the “Other” is no longer a distant someone whom we encounter primarily in the pages of a magazine, or on a video screen, or an exotic holiday trip. The “Other” increasingly is someone who appears in what we think of as “our space”, or even, “in our face.” And that reality can be hard to handle. When the Other is seen as a potential competitor, for a job for example, even when this fear is unfounded, then the challenge of pluralistic attitudes becomes even more difficult. For those who feel insecure, it is tempting to look for scapegoats, for someone to blame, when their self-esteem seems threatened. Often, we then find it easier to define our identity by what we are against, than by what we are for. Such fears may be culturally based, or economically driven, or psychologically rooted. But they should not be underestimated. And they will not be driven away by nice sounding words proclaiming lofty ideals. This is why I would emphasize, as Adrienne Clarkson has always done, our responsibility to improve the quality of life in places throughout the world where that quality is unsatisfactory - fighting poverty, improving health and education, expanding opportunity - as the first manifestation of a healthy pluralistic ethic. Pluralism means responding to diversity not only at home, but on a global basis, creating genuine “visions of opportunity” wherever constraints or reversals are in the air. But the growing challenge to pluralistic values does not happen only when people move physically from one place to another. As new technologies shrink the planet, distant forces become dire threats. We worry about the perils of environmental degradation, for example, including the spectre of climate change. We see how every local economy can be affected by distant economies. We realize how dangerous forces can spread across national borders - deadly diseases, or deadly weaponry, criminal networks or terrorist threats. And often, the human impulse is not to work across borders to meet these dangers, but to withdraw from a threatening world. One element that complicates this challenge is the way in which we communicate with our global neighbours. We think sometimes that the new technologies can save us. If we can connect faster, at lower cost, across greater distances, with more people, just think what could happen! We would all learn more about one another and perhaps understand one another better. But I am not sure that things are working out that way. The explosion of available information often means less focus on relevant information, and even a surfeit of misinformation. Thoughtful leadership often gives way to noisy chatter. Media proliferation is another challenge: what it often means is media fragmentation. Many now live in their own media bubbles, resisting diverse views. New technologies can make communication seem easier, but they can also make pluralism much more difficult. Yet another dimension of the challenge has to do with the realities of human nature. We often hear in discussions of Global Citizenship that people are basically alike. Under the skin, deep in our hearts, we are all brothers and sisters - we are told - and the secret to a harmonious world is to ignore our differences and to emphasize our similarities. What worries me, however, is when some take that message to mean that our differences are trivial, that they can be ignored, and eventually erased. And that is not good advice. In fact, it is impossible. Yes, our understanding and our underlying humanity should motivate our quest for healthy pluralism. But such a quest must also be built on an empathetic response to our important differences. And that, again, is a point which Adrienne Clarkson has emphatically articulated. My fear is that talking only about our common humanity might seem to threaten people’s distinctive identities. And that can complicate the challenge of pluralism. Who am I? Qui suis-je? We all must pose that question. Answers will grow out of basic loyalties - to family, faith, community, language, which provide a healthy sense of security and worth. But if the call for pluralism seems to dilute those old loyalties, then that new call may not be effective. Embracing the values of Global Citizenship should not mean compromising the bonds of local or national citizenship. The call of pluralism should ask us to respect our differences, but not to ignore them, to integrate diversity, not to depreciate diversity. The call for cosmopolitanism is not a call to homogenization. It means affirming social solidarity, without imposing social conformity. One’s identity need not be diluted in a pluralistic world, but rather fulfilled, as one bright thread in a cloth of many colours. When Adrienne Clarkson gave the Massey Lectures on CBC two years ago, she used a phrase that became her book’s title: “Belonging, the Paradox of Citizenship.” The word “paradox” expresses precisely the challenge I have been discussing. Perhaps the key to resolving the Paradox of Citizenship is to think about layers of overlapping identity. After all, one can honour a variety of loyalties - to a faith, an ethnicity, a language, a nation, a city, a profession, a school, even to a sports team! One might share some of these identities with some people, and other identities with others. My own religious community identifies proudly as Ismaili Muslims, with our specific interpretation of Islamic faith and history. But we also feel a sense of belonging with the whole of the Muslim world, what we call the Ummah. Within the Ummah, the diversity of identities is immense - greater than most people realize - differences based on language, on history, on nationhood, ethnicity and a variety of local affiliations. But, at the same time, I observe a growing sense within the Ummah of a meaningful global bond. When the question of human identity is seen in this context, then diversity itself can be seen as a gift. Diversity is not a reason to put up walls, but rather to open windows. It is not a burden, it is a blessing. In the end of course, we must realize that living with diversity is a challenging process. We are wrong to think it will be easy. The work of pluralism is always a work in progress. Some of that work will be done in our schools. What I have called the Cosmopolitan Ethic is not something that we are born with, it is something that must be learned. Similarly, the Institute for Canadian Citizenship, under the inspirational leadership of Adrienne Clarkson and John Ralston Saul, has been working to give people who are new to Canada a sense of belonging. But this process does not simply take care of itself. It requires planning, it requires persistence and ever-fresh thinking. It is work that is never finished. Finally, advancing the cause of Global Citizenship is not only a matter of building healthy, diversified societies, but also of maintaining them. Inevitably, new challenges will arise. Canada’s Chief Justice, the Right Honorable Beverly McLachlin, spoke of such challenges last year when she delivered the annual Lecture for our Global Centre for Pluralism. She spoke of how a cosmopolitan society needed, continually, to sort out the balance between healthy diversity and social cohesion. To do that well, she said, required a respect for human dignity, strong legal institutions, and a pluralistic institutional environment. For me, that latter strength implies a broadly diversified civil society - a healthy array of private organizations that are dedicated to public purposes. For pluralism to thrive will require the successful integration of diverse institutions and diverse leadership. These are just a few thoughts as I look to the future of Global Citizenship. The challenges, in sum, will be many and continuing. What will they require of us? A short list might include these strengths: a vital sense of balance, an abundant capacity for compromise, more than a little sense of patience, an appropriate degree of humility, a good measure of forgiveness, and, of course, a genuine welcoming of human difference. It will mean hard work. It will never be completed. But no work will be more important. 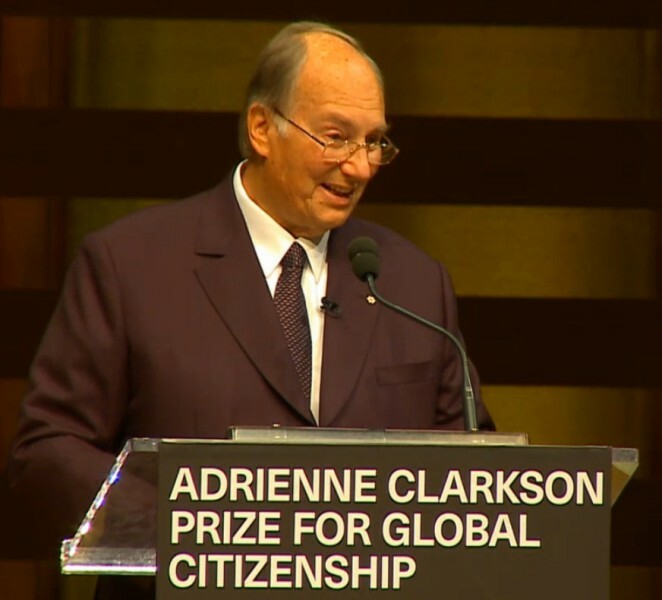 The Aga Khan is the winner of the inaugural Adrienne Clarkson Prize for Global Citizenship. The annual award recognises individuals who through thought and dialogue encourage approaches and strategies that strive to remove barriers, change attitudes and reinforce the principles of tolerance and respect. “We are pleased to announce that His Highness the Aga Khan is the first recipient of this globally relevant prize. "The 49th hereditary Imam (spiritual leader) of the Shia Ismaili Muslims, His Highness has dedicated his life’s work to improving living conditions for the world’s most vulnerable populations, and to fostering an understanding of the importance of pluralism to global harmony,” read a citation accompanying the announcement by the 6 Degrees, a new public initiative of the Institute for Canadian Citizenship. The prize is named after Madam Adrienne Clarkson, a former Canadian governor-general. “The symbolic importance of this prize has never been greater. In a time of unprecedented movement, displacement and resettlement by immigrants and refugees, one of the central challenges we face is how we all live together,” the statement added. 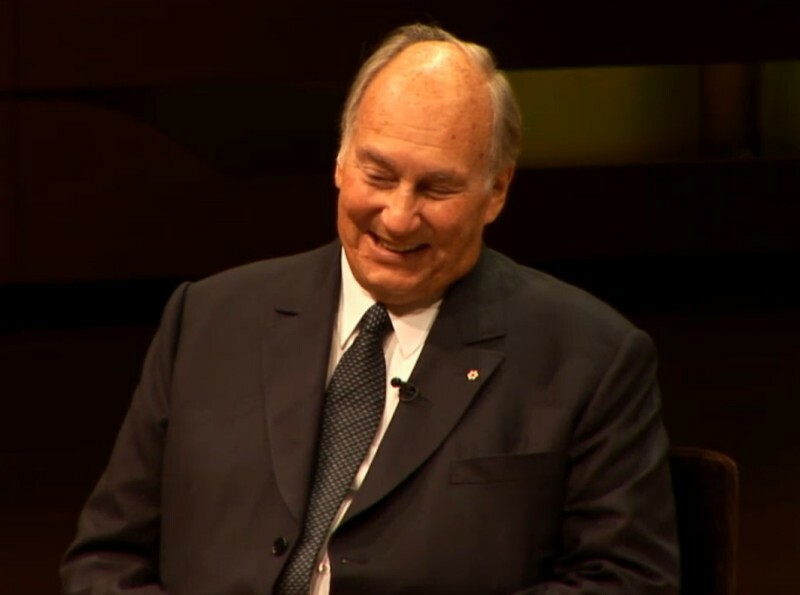 At the ceremony presided over by Ms Clarkson in Toronto on Wednesday, The Aga Khan shared his experiences with the audience on the issues confronting the world today. He was then joined on stage by Ms Clarkson. Toronto, Canada, 21 September 2016 - His Highness the Aga Khan was presented with the inaugural Adrienne Clarkson Prize for Global Citizenship at a ceremony at Toronto's Koerner Hall. The ceremony took place at the end of the 6 Degrees conference, developed to bring together leaders to discuss issues which threaten co-existence. Toronto, 21 September 2016 — Before a distinguished gathering at Toronto’s Koerner Hall, the Right Honourable Adrienne Clarkson presented Mawlana Hazar Imam with an award bearing her name and representing the convictions that she has long championed. “Tonight, this prize for Global Citizenship is recognising and celebrating His Highness the Aga Khan, whose entire life demonstrates steadfast unchanging commitment to the ideals of belonging and inclusion,” said the 26th Governor General of Canada and co-founder of the Institute for Canadian Citizenship. The Adrienne Clarkson Prize for Global Citizenship recognizes an individual who has, through thought and dialogue, encouraged approaches and strategies that strive to remove barriers, change attitudes and reinforce the principles of tolerance and respect. Hazar Imam became the inaugural recipient. “Through his words, through his actions, and through the results obtained by the institutions that he has founded and encouraged and nourished, he has become a light in much of the world’s conflicting darkness,” continued Madame Clarkson. Canada’s Prime Minister, the Right Honourable Justin Trudeau, expressed his own warm sentiments in a video message that was played during the ceremony. 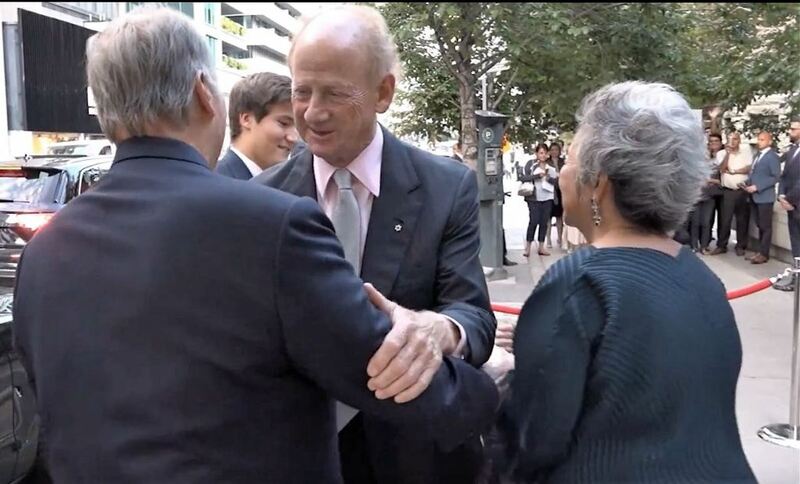 Mawlana Hazar Imam thanked Madame Clarkson, her husband John Ralston Saul and the Institute for Canadian Citizenship for the honour that they bestowed upon him. He then shared some thoughts on global citizenship and the ways in which it is being challenged today. “The concept of global citizenship,” said Mawlana Hazar Imam, “was something I began to think about seriously when I became the Imam of the Ismaili Muslims almost 60 years ago.” Implicit in the concept was a respect for many diversities — whether ethnic, linguistic, cultural, religious, or philosophical. But as diversity in human societies is increasing, learning to live with it is becoming more difficult observed Hazar Imam. Human migration is one dimension of this challenge. As more people move between countries, they are bumping up against narrow definitions of citizenship in which the Other becomes a source of fear and a scapegoat for insecurity. Healthy pluralism must allay these fears by seeking to improve quality of life by fighting poverty, improving health and education, and creating opportunity for people around the world. Mawlana Hazar Imam also touched upon the complications of connectivity. Although technology has significantly improved our ability to communicate, it has also brought misinformation and a growing resistance to diverse views. Indeed, it can be difficult for societies to make room for differing views, especially when they are in disagreement with one another. But ignoring our differences is not advisable, said Hazar Imam. Following his speech, Mawlana Hazar Imam sat down with Madame Clarkson to engage in a wide ranging conversation. They touched upon the conditions and barriers to opportunity faced in different countries, ignorance about Islam and Muslim civilisations in the Western world, the importance of planning and predictability when looking ahead, and the need for greater generosity in society. The ceremony also featured a video tribute to Mawlana Hazar Imam that looked back on his life and accomplishments. Internationally-acclaimed vocalist and songwriter Rufus Wainwright performed in his honour. A 2 minutes interesting video is provided in the link above. 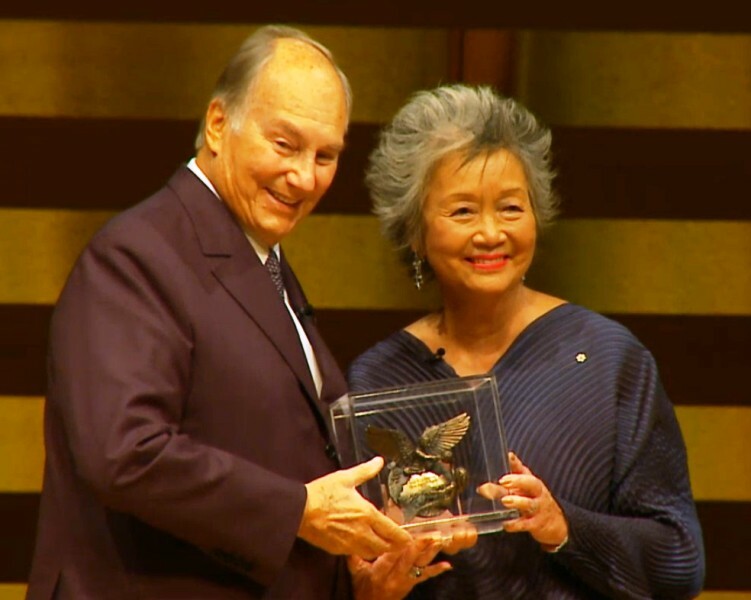 His Highness The Aga Khan, leader of the world’s 50 million Ismaili Musilms, receives the inaugural Adrienne Clarkson Prize for Global Citizenship. The annual award, earmarked for individuals who work to remove barriers and support the principles of tolerance and respect, is part of the 6 Degrees initiative. Among the dignitaries at the event were Ontario Premier Kathleen Wynne and Toronto Mayor John Tory. Farah Nasser reports. It was with reference to this last sentence that Madame Clarkson then began her conversation with Mawlana Hazar Imam. The following is a transcript that Simerg has prepared from a tape recording of the event, and we invite our readers to listen to the video of the wonderful event through the link that we have provided at the bottom of this page. Adrienne Clarkson: Thank you so much for those words. They are so well thought out, and over the years as we have known each other, I am always impressed by your deep sense of humane commitment and feeling that you have when you talk about things like forgiveness, and that, that is part of what we are as a society……One of the things I am very interested in, and I think everybody here is interested too, is in the fact that you put so much faith in Canada; that you have put institutions in Canada, like the Global Centre for Pluralism in Ottawa….And you have also put the Imamat in Ottawa. And when I think about it, I think: Is that because in 1972, we welcomed so many Ismailis. Is that the beginning of it, or is there something else about us: Is it that you are a secret fan of MacKenzie (inaudible). 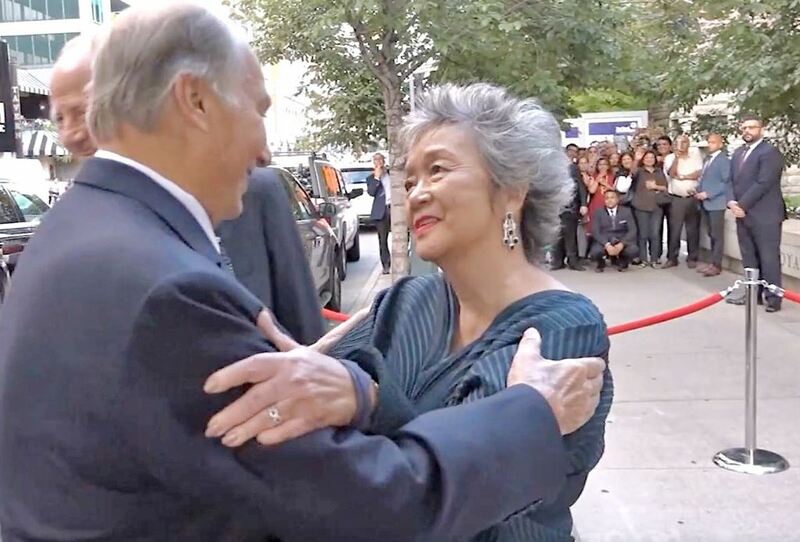 Adrienne Clarkson: Well, of course, you have given us an enormous gift to Toronto in the Aga Khan Museum and the Jamatkhana, which is now virtually the geographic centre of Metropolitan Toronto. And I think by those wonderful Islamic gardens with the pools of water, but using native Canadian trees, and native Canadian plants. I always think of you as somebody with a motto of: No idea too big, no detail too small. Because I know how you look at everything: you know, the grouting in the marble, the bulbs that will be planted, the colours of the bulbs. And, of course, that is an enriching thing for you to have that detail in your life, but also I think it enriches us. And when I think of the role that beauty and culture play in the message that you have to the world, I think we are enormously grateful to you…..
Adrienne Clarkson: Yes, yes, it is there. When we look at the world today……The rise of the Hard Right, of the really almost Fascist movements, reminds us sadly of times in the 1930s, and we have to really watch that because all that is to raise fear in people. And once fear rules people, they become blinded to all kinds of things. How do you deal with that? How do we deal with the fear? Correction - September 21, 2016: This article was edited from previous version to update an incorrect photo caption that misspelled Zahra Aga Khan's name. What a heart warming and unforgettable moment. Look carefully these 5 videos. In some our Imam waves at the Murids, in some he gives blessings. Can you spot the difference? This is a condensed version of an address delivered this week in Toronto by His Highness the Aga Khan, as he accepted the Adrienne Clarkson Prize for Global Citizenship at the inaugural Six Degrees “citizen space,” presented by the Institute for Canadian Citizenship. 6degreescanada.com. The award recognizes an individual whose life has demonstrated a steadfast commitment to the ideals of belonging and inclusion. The 6 Degrees Citizen Space conference is the new public initiative of the Institute for Canadian Citizenship. The award recognises an individual whose life has demonstrated a steadfast commitment to the ideals of belonging and inclusion. “The call of pluralism should ask us to respect our differences, but not to ignore them; to integrate diversity, not to depreciate diversity,” he remarked. 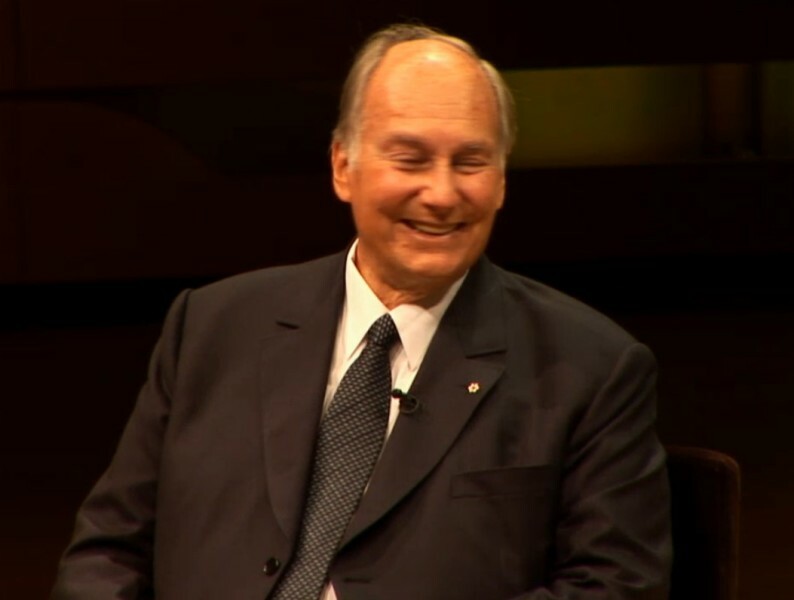 The Aga Khan, an honorary Canadian citizen and Companion of the Order of Canada, is the 49th hereditary imam of the Shia Ismaili Muslims and founder and chair of the Aga Khan Development Network (AKDN). The AKDN is active in 30 countries and employs approximately 80,000 people. 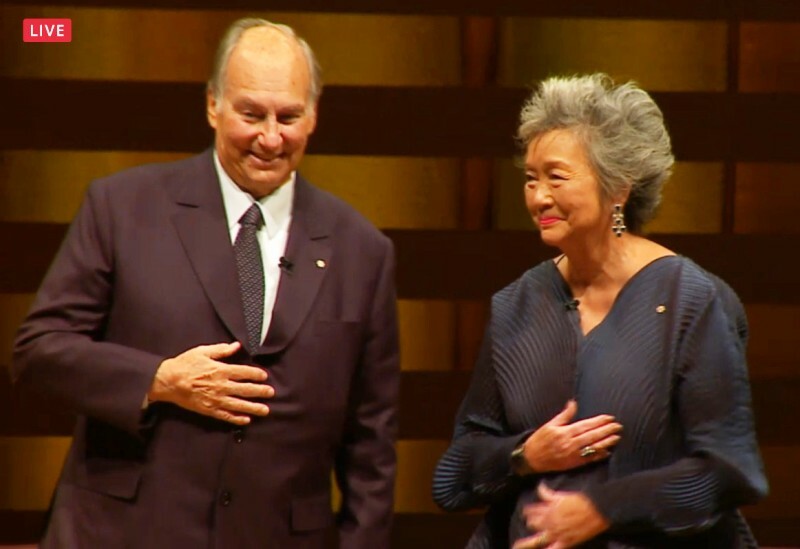 His Highness the Aga Khan was given the inaugural Adrienne Clarkson Prize for Global Citizenship at a ceremony at Toronto's Koerner Hall Tuesday, September 20. 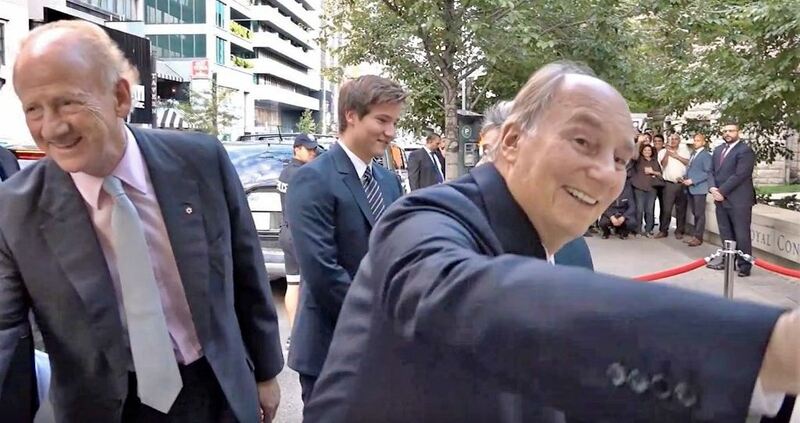 In his acceptance speech, the spiritual leader of Ismaili Muslims around the world warned of the threats to pluralism in Canada and abroad in the age of mass migration, Brexit, Donald Trump and the explosion of information technology. Below is an slightly edited and condensed excerpt from his address. The subheads have been added. We talk sincerely about the values of diversity, about living with complexity. But in too many cases more diversity seems to mean more division, greater complexity and more fragmentation, and more fragmentation can bring us closer to conflict. The stakes seem to be getting higher to the ideals of global citizenship. One enormous challenge, is the simple fact that diversity is increasing around the world. The task is not merely learning to live with that diversity, but learning to live with greater diversity with each passing year. More people are moving, willingly and unwillingly, across national frontiers than ever before. In country after country, the migration question is a central issue of political life. Often it is the central issue. And old habits of mind, including narrow, exclusionary definitions of citizenship, have not met the challenge. That was true three months ago when Great Britain voted to leave the European Union. It is true in pre-election debates in France, where I now live, and in the United States, where I went to university. It is true in Canada, though Canada has certainly been a world leader in expanding the concept of citizenship. But the challenge is felt everywhere. Nor is the migration challenge likely to dissipate any time soon, especially as war, violence, and economic deprivation, displace more and more people. When the other is seen as a potential competitor, for a job for example, even when this fear is unfounded, it is tempting to look for scapegoats, for someone to blame, when our self-esteem seems threatened. Often, we then find it easier to define our identity by what we are against, than by what we are for. This is why I would emphasize our responsibility to improve the quality of life in places throughout the world – fighting poverty, improving health and education, expanding opportunity – as the first manifestation of a healthy pluralistic ethic. Pluralism means responding to diversity not only at home, but on a global basis. But the growing challenge to pluralistic values does not happen only when people move physically from one place to another. As new technologies shrink the planet, distant forces become dire threats. We worry about the perils of environmental degradation, for example. We see how every local economy can be affected by distant economies. We realize how dangerous forces – deadly diseases, or deadly weaponry, criminal networks or terrorist threats – can spread across national borders. And often, the human impulse is to withdraw from a threatening world. One element that complicates this challenge is the way in which we communicate with our global neighbours. We think sometimes that the new technologies can save us. If we can connect faster, at lower cost, across greater distances, with more people, just think what could happen! We would all learn more about one another and perhaps understand one another better. But I am not sure that things are working out that way. The explosion of available information often means less focus on relevant information, and even a surfeit of misinformation. Thoughtful leadership often gives way to noisy chatter. Media proliferation is another challenge. What it often means is media fragmentation. Many now live in their own media bubbles, resisting diverse views. Yet another dimension of the challenge has to do with the realities of human nature. We often hear in discussions of global citizenship that people are basically alike. Under the skin, deep in our hearts, we are all brothers and sisters – we are told – and the secret to a harmonious world is to ignore our differences and to emphasize our similarities. What worries me is when some take that message to mean that our differences are trivial, that they can be ignored, and eventually erased. And that is not good advice. In fact, it is impossible. Yes, our understanding and our underlying humanity should motivate our quest for healthy pluralism. But talking only about our common humanity might seem to threaten people’s distinctive identities. Who am I? We all must pose that question. Answers grow out of basic loyalties to family, faith, community, language, which provide a healthy sense of security and worth. Embracing the values of global citizenship should not mean compromising the bonds of local or national citizenship. The call of pluralism should ask us to integrate diversity, not to depreciate diversity. My own religious community identifies proudly as Ismaili Muslims, with our specific interpretation of Islamic faith and history. But we also feel a sense of belonging with the whole of the Muslim world, what we call the Ummah. Within the Ummah, the diversity of identities is immense – based on language, on history, on nationhood, ethnicity and a variety of local affiliations. But, at the same time, I observe a growing sense within the Ummah of a meaningful global bond. When the question of human identity is seen in this context, then diversity itself can be seen as a gift. In the end of course, we must realize that living with diversity is a challenging process. We are wrong to think it will be easy. The work of pluralism is always a work in progress. The challenges will be many and continuing. What will they require of us? A short list might include: a vital sense of balance, an abundant capacity for compromise, more than a little sense of patience, an appropriate degree of humility, a good measure of forgiveness, and a genuine welcoming of human difference. It will never be completed. But no work will be more important. The marquee event at the inaugural 6 Degrees, the Adrienne Clarkson Prize for Global Citizenship is to be awarded annually to a leader whose life has demonstrated a steadfast commitment to the ideals of belonging and inclusion. Through words, actions and results, this individual has encouraged thought and dialogue, approaches and strategies that strive to remove barriers, change attitudes, and reinforce the principles of tolerance and respect. The symbolic importance of this prize has never been greater. In a time of unprecedented movement, displacement and re-settlement by immigrants and refugees, our central challenge is how we are all to live together. This must involve upholding human rights, while both engendering inclusion and respect for each other, and celebrating the cultural differences that make us unique. This challenge of weaving together human rights and cultural differences will permit us to leave behind the old racial and religious divisions. This is the basis for true citizenship - meaningful engagement by citizens for citizens founded on shared principles and values.